President David Granger addressing Parliament on Thursday, January 14, 2016. In the foreground at left is Opposition Leader, Bharrat Jagdeo. Four months after a pro-government group of rice farmers called for the establishment of a stabilisation fund, President David Granger has announced that his government would be doing so. For years Guyana’s rice sector which is a principal export has been subjected to the volatility of the international market. This has left local farmers crying out and up in arms for government relief. Granger during his latest address to the National Assembly announced the plan to establish the fund. “We will expand rice cultivation and establish a stabilisation fund for the export prices of rice,” the President stated. The fund will come as part of an overall reform of several sub-sectors of Guyana’s agricultural sector. 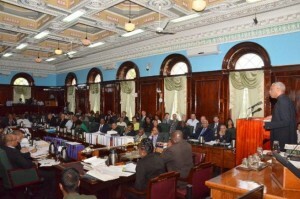 Expounding on the stabilization fund, Agriculture Minister Noel Holder explained that it would be facilitated by the Guyana Rice Development Board (GRDB). He explained that the fund answers the question of coming up with an arrangement where rice farmers aren’t exposed too much to the shocks of the rice market trade on the international market. “We are looking at some mechanism through the grdb system where the shocks would not have to be so….If price is 450 we work towards giving them a 425 (United States dollars) and if price is 350 we work towards giving them a 375,” said Holder. The Rice Producers’ Association Action Committee (RPAAC) in September 2015 had called on government to keep its election promise to set up the fund. Leading RPACC figures are Jinnah Rahman and Turhane Doerga both of whom had endorsed the coalition in the run-up to the May 11, 2015 general and regional elections.